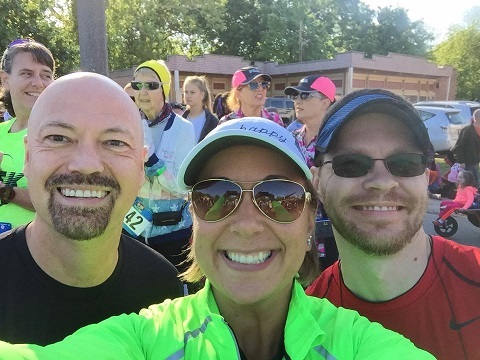 Ferguson Twilight Run 5k/10k – SeanHiatt.ws :: Version 4.0! It was a breezy, cool evening and I was in St. Louis, MO visiting some friends. It was a great day for a race and I was feeling pretty pumped to go out and run hard. On my way to the Ferguson Twilight 5k/10k. I must say that Ferguson, MO is not the town the US national media has made it out to be. It does have some nice neighborhoods but one thing is for sure, there are some good people that live in the town. I think the town has received a bad rep for something it’s not — which is a run down, poor suburb of St. Louis. Every town has its problems and each town has to find a way to handle those problems. It was 59 degree, with winds of about 10 MPH, and mostly sunny; ideal temperatures for a medium distance race. I felt relatively well rested after spending much of the day touring around St. Louis. I was ready to run the Ferguson Twilight Run 5k/10k! The course was a little hilly but overall not too bad. The first two miles was a steady climb where I tried to maintain a pace to conserve my energy which was between 9:00/mi and 9:15/mi. We weaved through several offshoots in the neighborhood up and down some small hills and then we made a nice descent down towards the main street of Ferguson. It was here that I let gravity help me and kicked up my pace to sub 8:30/mi. The only caveat was there is a small hill right around the 5.50 mile marker that I didn’t plan for. I walked it since there was also a water station but got back to my race pace of about 8:30/mi. I’m happy to say I finished the race with an average pace of about 8:53/mile and I set a new PR for the 10k distance. Previously it was 58:19 and it is now 55:51, an improvement of about 2 minute and 20 seconds. 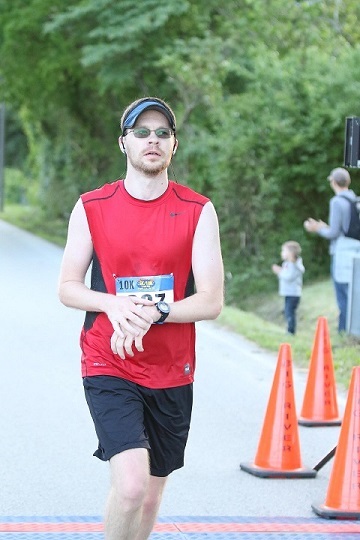 I finished 67th out of 256 (26.2 percentile); 53rd out of 104 in my gender (51.0 percentile); and 14th out of 30 in my division 30-39 (46.7 percentile). Residents of Ferguson did a good job of supporting the race. At one water stop I was a little winded and thanked the nice women manning the station and they loudly responded “You’re Welcome!” Their energy gave me energy and I kicked it up a notch to push on. There were people along the streets and in their yards throughout the course. There were, what I presume, some local vendors at the finish line providing food and water/gatorade to runners. Overall, I would run this race again if given the opportunity. I felt like the race was well run, the course while a little hilly is very pretty, and well supported by local residents.